(Nanowerk News) The University of Illinois at Urbana-Champaign has received a five–year, $25-million grant from the Bill & Melinda Gates Foundation to improve the photosynthetic properties of key food crops, including rice and cassava. The project, titled "RIPE – Realizing Increased Photosynthetic Efficiency," has the potential to benefit farmers around the world by increasing productivity of staple food crops. Illinois research will take place at the Institute for Genomic Biology (IGB), a state-of-the-art facility whose large shared laboratories accommodate multiple groups and encourage cross-discipline interaction. "This grant will be game changing," says Stephen Long, Project Director and Gutgsell Endowed Professor of Crop Sciences and Plant Biology at Illinois. "This project represents a huge effort to determine and apply the mechanisms of photosynthesis that can contribute to the challenge of this century: food security for all." 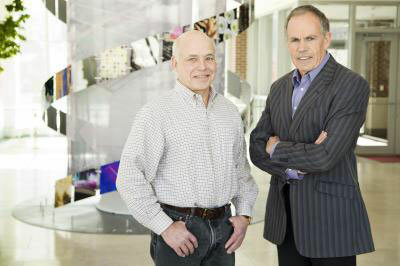 tephen Long (right), Gutgsell Endowed Professor of Crop Sciences and Plant Biology at University of Illinois, will serve as Project Director on a five–year, $25-million grant from the Bill & Melinda Gates Foundation to improve the photosynthetic properties of key food crops. Don Ort, Robert Emerson Professor of Plant Biology at University of Illinois, will serve as Associate Director. Illinois research will take place at the Institute for Genomic Biology. Increasing photosynthetic efficiency has not yet been addressed by conventional breeding methods, though it has the potential to increase yields and reduce the use of water and nitrogen. Team members will apply recent advances in photosynthesis research and crop bioengineering to the RIPE project. In addition, computer simulation models of the highly complex photosynthetic system, combined with practical engineering, will identify the best targets for improving photosynthesis efficiency. "The UN Food and Agricultural Organization predicts that the world will need to increase staple crop yields 70% by 2050," says Long. "The rapid increases that were achieved during the Green Revolution have slowed and will not meet this target. Photosynthesis promises a new area, ripe for exploitation, that will provide part of the yield jump the world needs to maintain food security." The University of Illinois, a pioneer in the impact of global change factors on crop plants, will lead the study. The University is home to SoyFACE (Soybean Free Air Concentration Enrichment), an outdoor facility for growing crops under a variety of atmospheric climatic conditions that has shown strong evidence linking increased photosynthesis to consistently higher crop yields over the 10 years of its operation. Illinois is also home to the American Recovery and Reinvestment Act PETROSS program, which is engineering improved photosynthesis into two key US bioenergy crops, sugarcane and sorghum. Don Ort, Associate Director of the project and Robert Emerson Professor of Plant Biology at Illinois and USDA–Agricultural Research Service Research Leader, states "Business as usual crop development in the face of accelerating agricultural demand and the challenges of rapid global change will not get the job done. This award invests in unique strengths at Illinois as well as at our collaborating institutions and holds exceptional promise for broad impact outcomes." Ort leads the IGB research theme Genomic Ecology of Global Change. "This grant reflects the historic excellence of photosynthesis research on this campus, and the cutting-edge approaches that have been developed for plant science at the IGB over the past few years by the members of the Genomic Ecology of Global Change and Energy Biosciences research themes," says IGB Director Gene Robinson. Illinois will conduct the study through an international collaboration with other leading research institutions as sub-contractors of Illinois, which will initially include the Australian National University, Rothamsted Research (UK), University of Essex (UK), and USDA/ARS. Objective 1. Importing algal mechanisms for carbon dioxide concentration at Rubisco. Lead: Murray Badger, Canberra with sub-award to James Moroney, Louisiana State University. Objective 2. Improving the photorespiratory bypass. Lead: Don Ort, Illinois. Objective 3. Transplanting better Rubiscos. Lead: Martin Parry, Rothamsted Research. Objective 4. Improving leaf photosynthetic carbon metabolism. Lead: Christine Raines, University of Essex. Objective 5. Improving crop canopy light distribution for greater photosynthesis and water use efficiency. Lead: Steve Long, Illinois; with sub-award to Kris Nyogi, Berkeley. Objective 6. Modeling crop photosynthetic productivity - from primary events to final yield. Lead: Steve Long, Illinois, with sub-award to Xinguang Zhu, CAS-MPI, Shanghai. Objective 7. Transforming plastids. Lead: To be determined, subject to funding availability and partnerships with donors.